1. to turn to one side; to divert; to bypass. 2. a passage or anastomosis between two natural channels, especially between blood vessels. Such structures may be formed physiologically (e.g., to bypass a thrombosis), or they may be structural anomalies. arteriovenous shunt a U-shaped plastic tube inserted between an artery and a vein (usually between the radial artery and cephalic vein), bypassing the capillary network, a formerly common means of arteriovenous access. cardiovascular shunt an abnormality of the blood flow between the sides of the heart or between the systemic and pulmonary circulation; see left-to-right shunt and right-to-left shunt. jejunoileal shunt an intestinal bypass performed to control obesity. left-to-right shunt diversion of blood from the left side of the heart to the right side, or from the systemic to the pulmonary circulation through an anomalous opening such as a septal defect or patent ductus arteriosus. mesocaval shunt a portosystemic shunt between the superior mesenteric vein and the inferior vena cava to reduce portal hypertension. peritoneovenous shunt a device whose purpose is to remove excess ascitic fluid from the peritoneal cavity and return it to the venous system; called also LeVeen shunt. The shunt consists of a peritoneal tube, a one-way valve, and a tube leading to a large vein, usually the superior vena cava or the jugular vein. The perforated peritoneal tube is placed in the peritoneal cavity and attached to the one-way valve which opens at a pressure of 3 cm H2O. The valve controls the direction of the flow of ascitic fluid and prevents a backflow of blood from the vein. A tube leading from the valve empties into the venous system. The shunt is triggered into action by the patient's breathing. Upon inspiration, the diaphragm descends toward the abdominal cavity and causes a rise in fluid pressure in the thoracic superior vena cava. The difference in pressure, usually about 5 cm H2O, opens the shunt valve, allowing the flow of ascitic fluid into the large vein. The action of the shunt can be enhanced by the patient's inspiring against pressure, as when using a blow bottle. A disadvantage of the shunt is dilution of the blood and a resultant drop in hematocrit, which necessitates transfusion of packed cells and perhaps a slowing of the rate of flow of ascitic fluid into the venous system. Other inherent risks are infection, leakage of ascitic fluid from the operative site, elevated bilirubin, gastrointestinal bleeding, and disseminated intravascular coagulation. Peritoneovenous (LeVeen) shunt for chronic ascites moves fluid from the peritoneal (abdominal) cavity into the superior vena cava. From Ignatavicius and Workman, 2000.
portacaval shunt a portosystemic shunt between the portal vein and the vena cava. portosystemic shunt a surgically created shunt that connects the portal and systemic circulations, such as a mesocaval, portacaval, or splenorenal shunt. pulmonary shunt an anomaly in which blood moves from the venous circulation to the arterial circulation without participating in gas exchange, resulting in hypoxemia. right-to-left shunt diversion of blood from the right side of the heart to the left side or from the pulmonary to the systemic circulation through an anomalous opening such as septal defect or patent ductus arteriosus. splenorenal shunt an anastomosis of the splenic vein and the left renal vein, created to lower portal hypertension following splenectomy. ventriculoatrial shunt the surgical creation of a communication between a cerebral ventricle and a cardiac atrium by means of a plastic tube; done for relief of hydrocephalus. 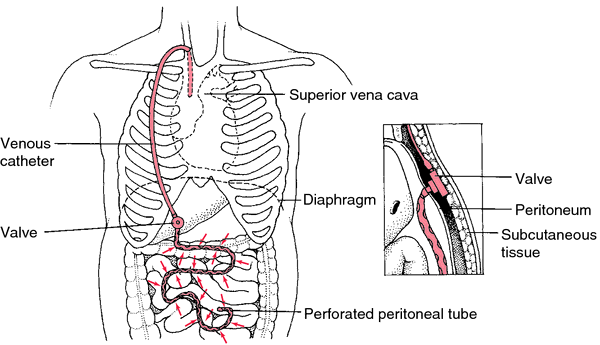 ventriculoperitoneal shunt a communication between a cerebral ventricle and the peritoneum by means of plastic tubing; done for the relief of hydrocephalus. ventriculovenous shunt a communication between a lateral ventricle and the venous system by means of a plastic tube; done for relief of hydrocephalus. 1. To bypass or divert. 2. A bypass or diversion of fluid to another fluid-containing system by fistulation or a prosthetic device. The nomenclature commonly includes origin and terminus, for example, atriovenous, splenorenal, ventriculocisternal. 1. to turn to one side; to bypass. 2. a passage or anastomosis between two natural channels, especially between blood vessels, formed physiologically or anomalously. 3. a surgically created anastomosis; also, the operation of forming a shunt. 1. the diversion of blood from an artery directly to a vein. 2. a U-shaped plastic tube inserted between an artery and a vein; usually to allow repeated access to the arterial system for hemodialysis. Blalock-Taussig shunt see under operation. cardiovascular shunt diversion of the blood flow through an anomalous opening from the left side of the heart to the right side or from the systemic to the pulmonary circulation (left-to-right s.), or from the right side to the left side or from the pulmonary to the systemic circulation (right-to-left s.) . left-to-right shunt see cardiovascular s.
LeVeen peritoneovenous shunt continuous shunting of ascites fluid from the peritoneal cavity to the jugular vein by means of a surgically implanted subcutaneous plastic tube. portacaval shunt surgical anastomosis of the portal vein and the vena cava. Shunts diverting portal venous blood flow from the liver. (A), Portacaval shunt; (B), splenorenal shunt. right-to-left shunt see cardiovascular s.
splenorenal shunt removal of the spleen with anastomosis of the splenic vein to the left renal vein. ventriculoatrial shunt the surgical creation of a communication between a cerebral ventricle and a cardiac atrium by means of a plastic tube, to permit drainage of cerebrospinal fluid for relief of hydrocephalus. 1. The act or process of turning aside or moving to an alternate course. 2. Medicine A passage between two natural body channels, such as blood vessels, especially one created surgically to divert or permit flow from one pathway or region to another; a bypass. Medicine To divert or permit flow of (a body fluid) from one pathway or region to another by surgical means. 1 to redirect the flow of a body fluid from one cavity or vessel to another. 2 a tube or device implanted in the body to redirect a body fluid from one cavity or vessel to another. See also left-to-right shunt, right-to-left shunt. The diversion of the flow of a fluid—in particular blood, but also cerebrospinal fluid—from its normal route to another, which may be accidental, as in a traumatic arterio-venous aneurysm, or by design (e.g., portocaval shunt or ventriculoperitoneal shunt). 1. Those in which already oxygenated blood in the left heart passes back into the right heart–left-to-right shunt and. 2. A bypass or diversion of fluid to another fluid-containing system by fistulation or a prosthetic device. The nomenclature commonly includes origin and terminus, e.g., atriovenous, splenorenal, ventriculocisternal. 1. To turn away from; to divert. 2. An anomalous passage or one artificially constructed to divert flow from one main route to another. 3. An electric conductor connecting two points in a circuit to form a parallel circuit through which a portion of the current may pass. A normal or abnormal direct connection between arterial and venous circulation. An example of a normal anatomical shunt is the bronchial and thebesian vein connection. An abnormal connection between an artery and the venous system. An abnormal connection between the cavities of the heart or between the systemic and pulmonary vessels. The passage of blood from the left side of the heart to the right side through an abnormal opening (e.g., a septal defect). The route by which pulmonary blood perfuses unventilated alveoli. This process is caused by an imbalance between ventilation and perfusion. The movement of blood or other body fluids backward through a shunt. The shunted blood has no opportunity to become oxygenated because of failure to pass through the lungs. A shunt that is inserted through the skin, jugular vein, and liver and then into the portal venous system to manage complications of portal hypertension, such as bleeding caused by esophageal varices or uncontrollable ascites. The shunt decreases pressure within the portal venous circulation (e.g., in patients with cirrhosis), bypassing the liver and allowing portal blood to flow directly into the vena cava. A common complication of the procedure is altered mental status, since blood that was previously detoxified by the liver is directed around it. Any bypassing or sidetracking of flow, especially of fluid such as blood or cerebrospinal fluid. A shunt may be the result of disease or may be surgically induced, or inserted as a prosthesis, to effect treatment. A small tube placed in a ventricle of the brain to direct cerebrospinal fluid away from the blockage into another part of the body. 2. Bypass or diversion of fluid to another fluid-containing system by fistulation or a prosthetic device. n 1. a hole or passageway that allows the movement of fluid, such as cerebrospinal fluid, from one body part to another. The term is used to describe congenital or acquired shunts, which may be either mechanical or biologic. 2. a surgically implanted tube or catheter, such as those used to treat hydrocephalus, that allows the passage of fluid between body parts. n (arteriovenous aneurysm, arteriovenous fistula), an abnormal communication between an artery and a vein; usually caused by trauma. n a surgically manufactured passage made of plastic tubing between a cardiac atrium and cerebral ventricle for the treatment of hydrocephalus. See also ventriculoureterostomy. 2. a passage or anastomosis between two natural channels, especially between blood vessels. Such structures may be formed physiologically (e.g. to bypass a thrombosis), or they may be structural anomalies. 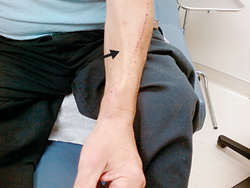 a U-shaped or straight tube inserted between an artery and a vein (usually between the radial artery and cephalic vein), bypassing the capillary network; commonly done to allow repeated access to the arterial system for the purpose of hemodialysis. an abnormality of the blood flow between the sides of the heart or between the systemic and pulmonary circulation; see left-to-right shunt (below) and right-to-left shunt (below). diversion of blood from the left side of the heart to the right side, or from the systemic to the pulmonary circulation through an anomalous opening such as a septal defect or patent ductus arteriosus. a device whose purpose is to remove excess ascitic fluid from the peritoneal cavity and return it to the venous system. Called also peritoneal-venous shunt. a catheter placed to transfer pleural fluid into the peritoneal cavity; requires manual pumping. diversion of blood from the right side of the heart to the left side or from the pulmonary to the systemic circulation through an anomalous opening such as septal defect or patent ductus arteriosus. a surgical procedure used in the treatment of hydrocephalus.